Richard Siegel's interest in immunology and apoptosis began in the late 1980's at the University of Pennsylvania School of Medicine where he was an M.D., Ph.D. student. Working with Mark Greene and John Reed, he studied the influence of bcl-2 on T cell apoptosis and repertoire selection. He trained in Internal Medicine and Rheumatology at Hospital of the University of Pennsylvania, and moved to the NIH in 1996 to do postdoctoral training with Michael Lenardo in the Laboratory of Immunology in the National Institute of Allergy and Infectious Disease. There he studied apoptosis signaling and the molecular basis of its impairment in patients with inherited mutations in Fas/CD95 and the Autoimmune Lymphoproliferative Syndrome (ALPS). In 2001, Dr. Siegel moved to NIAMS as a tenure-track investigator. His current research interests include regulation of cellular survival and death in the immune system by TNF receptor and other signaling pathways, and the relevance of these pathways to autoimmune diseases and immune tolerance. He is a member of the American Society of Clinical Investigation and serves on the editorial board of the Journal of Biological Chemistry. 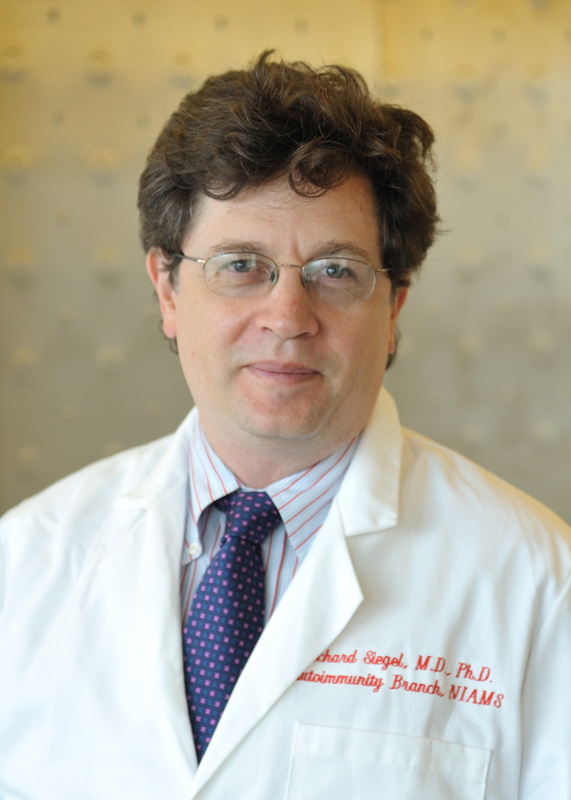 Dr. Siegel is also active in student training and directs the NIH intramural M.D./Ph.D. training program.